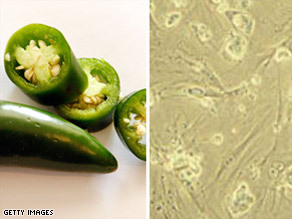 The salmonella scare and advances in stem cell research were two of the top health headlines of 2008. This year's advances in stem cell research could revolutionize organ transplants. A Colombian woman received a trachea transplant using her own stem cells so her body would not reject the transplant. The trachea is an airway essential for breathing. A similar transplant surgery used rat stem cells to transplant a rat heart at the University of Minnesota. Existing cells in a dead rat's heart were cleansed in a process called "decelluarization." New heart cells from baby lab rats were injected into the casing and taught to pump using a pacemaker. The rodent transplant has spurred experiments with pig hearts, opening possibilities of using animal organs for human transplant surgeries someday. Debate over the causes of autism continued to rage after a court decided to compensate a family whose daughter developed the disorder after receiving childhood vaccinations. For years, some parents have contended that childhood vaccinations cause autism. But studies published in the New England Journal of Medicine and elsewhere have found no link between autism and vaccines. Additionally, the Centers for Disease Control and Prevention, the American Academy of Pediatrics, the Institute of Medicine and other medical organizations have repeatedly asserted that vaccines are safe. But the Department of Health and Human Services' Division of Vaccine Injury Compensation concluded that Hannah Poling, a child who had been predisposed to autism, had a condition that was "significantly aggravated" by vaccinations and that her family should be compensated. Hannah began having problems after receiving nine childhood vaccines in 2000, said her father, Dr. Jon Poling, a neurologist in Athens, Georgia. While the Polings said they don't oppose childhood vaccinations, they want thimerosal, a mercury vaccine preservative, removed. Thimerosal was removed from infant vaccines beginning in 1999. Even after its removal, the autism rate has continued to climb. The CDC estimates that one in 150 children is affected. The United Nations declared the first official World Autism Awareness Day on April 2 this year. Contaminated peppers and milk sickened thousands of people, triggering worldwide concerns about food safety. Questions about Chinese food safety persisted as tainted products continued to create panic and health scares. In 2008 four infants died and more than 53,000 infants were sickened in China by the toxic chemical melamine discovered in baby formulas. Melamine is commonly used in plastics, fertilizer and fire-retardant material. Investigators suspect that melamine was used to water down milk in an attempt to sell more of it and to fool quality checks. Authorities have implicated 22 Chinese dairy companies in the scandal. White Rabbit candies, Cadbury chocolate bars and Lipton Milk Teas sold in Asia were taken off shelves. The FDA began blocking the import of milk products from China in an effort to prevent products from entering the U.S. market. Food safety concerns were not restricted to China. U.S. health officials first suspected tainted tomatoes carried the salmonella that left 1,400 people hospitalized and may have contributed to two deaths. They later determined that jalapeño and serrano peppers from Mexico carried the salmonella. In a period of economic uncertainty, record rates of unemployment and the turbulent economy have left many American families without health insurance, propelling the issue of health care reform into the historic presidential race. During the campaign, Sen. John McCain and now President-elect Barack Obama acknowledged the flaws of the U.S. health care system but varied in ideas to fix it. Obama has said expanding access to health insurance is one of his top priorities. He chose former Sen. Tom Daschle, who believes in universal health care, to lead the Department of Health and Human Services. A severely disfigured American woman became the fourth person in the world to receive a face transplant. Facial transplants pose ethical questions because the complicated and risky procedure aims to improve the quality of life rather than save a life. It also carries the risk that the recipient's body will reject the transplant, although the Cleveland Clinic doctors who performed the most recent surgery say they haven't seen any signs of that. Patients who undergo a face transplant have to take immune-suppressing drugs that compromise their body's ability to fight other diseases. A Chinese man who was the second patient ever to receive a partial face transplant died of unknown causes in July. Neither the identity of the American patient nor the donor has been revealed. In Arizona, paramedics began using a new CPR method. They skip the breathing step and instead, alternate two minutes of chest compressions with a single shock from a defibrillator. Physicians in Arizona reported that the new regimen has tripled the long-term survival rate, which went from 4.7 percent to 17.6 percent. Weeks after the Arizona study was published, the American Heart Association revised its official guidelines to promote breathless resuscitation as the preferred method for bystanders without CPR training.